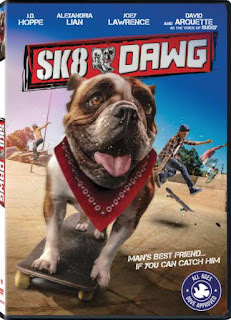 In additional to our nightly holiday movie selection, we watched SK8 Dawg last night, and the whole family loved it. Usually I wait until Fridays to watch a movie with the girls, but as soon as my oldest daughter saw this movie arrive in the mail yesterday, she couldn't wait to watch it. If you follow my blog, then you know that my girls, especially my oldest is a huge dog and cat lover. She can't go a day without wearing some type of clothing that has a dog or cat on it. And, usually when it is her time to choose a movie for our weekly movie night, the movie has to have these or other animals in it. My girls had never heard of this movie before seeing it arrive at our door yesterday. All they could tell from the cover art was that it was about a dog riding a skateboard. That alone caught their attention and they wanted to see him riding the skateboard around. I was quick to pick up that this was a Dove Approved movie, so I knew it would be perfect for every member of the family and appropriate content wise for my girls. "Everyone in Tommy’s life — his sister, his dad, his neighbor, even his dog — is an awesome skateboarder. Everyone except Tommy himself! Sick of getting teased for being a klutz, Tommy accepts a skate-off challenge from the local bully, Frankie. Can his friend Alice and his pooch, Buddy (voiced by David Arquette, Scream franchise), teach Tommy to flip, ollie, grab, and slide in time for the big showdown? This fun, skate-crazy family flick also stars Joey Lawrence (TV’s “Melissa & Joey”)." Joey Lawrence (TV’s “Blossom” and “Melissa & Joey,” Oliver & Company), Sara Fletcher (TV’s “Mom Tested,” Bad People) and David Arquette (Scream franchise, Never Been Kissed, Eight Legged Freaks). Thanks to the kind folks at Lionsgate Home Entertainment, two (2) lucky Inspired by Savannah readers will win a copy of this upcoming family-friendly movie. To enter, please complete the entries on the Rafflecopter form below. Good luck! Like to win for 3 little girls.